As I was reviewing some old e-clippings I had acquired over the previous months, I noted one that revived an ongoing conundrum for me. Has one or more of the Loch Ness Monster individuals sported a dorsal fin at varying points over these past eight decades. The clipping in question was taken from the Dundee Evening Telegraph dated the 19th July 1938. This is a sighting that was not on my database, so I presume it is one that has gone under the radar of the general Nessie literature. Be that as it may, this reminds me of last year's dorsal fin photograph which evoked much controversy as the sceptics tried to interpret it as an osprey. 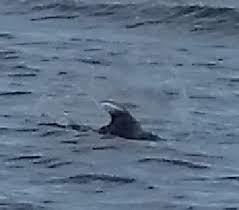 To me it is a dorsal fin and the best proof that something with such an appendage is at various times to be found in the loch. And then there is the famous Adams/Lee fin photograph which clearly shows a dorsal fin and the only argument is where it was taken. Attempts to find the uncropped picture have failed, but there are good reasons to think it was taken at Fort Augustus. We have had such experts as Jeremy Wade suggesting a finned Greenland Shark as a visitor to the loch and there is the older controversy over whether dolphins or porpoises were in the loch in September 1914. Are these real cetacean visitors to the loch, distinct from any mysterious monster or are they one and the same? If we accept that something as water dependent as a dolphin can get into Loch Ness, the case for something else getting in which is more amphibious strengthens. Anyway, this is also a bit of a preamble before an overdue article on whether Nessie is a visitor to Loch Ness rather than a resident.